When Anshie, blogger at Spice Roots asked members of Bread Bakers group to bake breads from Italy as the April theme, I was really excited. I love the country and Italian breads with all that olive oil, roasted tomatoes, cheese, bell peppers. I’ve been wanting to try out panettone for such a long time, so I got the opportunity to bake it for this theme. Panettone bread is usually baked as a Christmas breakfast or dessert treat in Italy. Full of fruit and wonderful aroma of orange, its suppose to like a cake but with yeast. Panettone means pane de tono— bread of luxury.Its believed that this rich Italian bread has originated from Milan. When yeast was considered a luxury item, this bread was baked only during important religious events. Original panettone making process is long where the dough is allowed to proof for several days which adds to the fluffy texture. Fruits added to the bread are not soaked as in other sweet breads from other parts of Europe. However, modern world means newer techniques. Fruits are soaked in rum or sweet wine and added to the dough. Nowadays the dough is not allowed to proof for days. I first tasted a panettone years back when I had gone to UK to visit my parents. I fell in love with the cake like delicious rich bread. Having it with some butter and a cup of coffee was the ultimate treat. I know Christmas is far away, but who can wait for Christmas to bake this fruity bread? I had to grab the opportunity now and bake it. Panettone is sometimes considered as a dessert and served with dessert wine, tea or coffee or even with some mascarpone cheese. Leftover panettone is used to prepare French Toast. Mix flour, yeast and water in a medium bowl. Cover with a lid or cling film and let it ferment overnight or for 8-10 hours. Mix flour, salt, sugar, yeast and zest in a big bowl. Add ¼ cup butter and rub it into the flour. Add eggs, Fiori di Sicilia and milk to the starter and whisk till its all mixed. Add the starter mixture to the flour. Mix with a wooden spoon. The dough will be quite sticky at this stage. Cover and let the dough rise till its nearly double the size.This will take about 1½ hours in warm climate. Mix raisins, mixed candied peel and cranberries and keep on the side till required. Lightly flour the worktop and remove the dough from the bowl onto the work top. Adding the remaining butter and dried fruits to the dough. Knead till the fruit is all mixed into the dough. Cover the dough and let it rest for 10-15 minutes. Deflate the dough and divide it into 12 parts. Grease a muffin tray or line it with cake cups. I chose to use cardboard cake cups that I had got so overly excited about! Roll each dough part into a round shape and drop it into the prepared muffin tray. Cover the tray with cling film and let the dough rise till its above the rim. I had to let it rise for 50-60 minutes. Bake the mini panettone for 25-30 minutes until golden brown. If they brown too quickly then cover the top with an aluminium foil. Brush butter over the top as soon the panettone is ready. Serve as it is or sprinkle icing sugar and then serve. I didn’t get mini panettone molds so I chose to use cardboard cake cups. You can use a normal muffin tray which can be lined with muffin cups or brown/parchment paper. To make a big panettone you will need a panettone pan or a straight sided tall pan about 1½ – 2 quart pan. * Fiori de Sicilia is ‘Flower of Sicily’, is an extract that combines vanilla, citrus and flower essence.If you don’t get fiori di Sicilia you can add 1tsp vanilla and ⅛ tsp of orange oil and rose water for the floral fragrance. I added 1 tsp vanilla essence and 1tbsp orange blossom water. 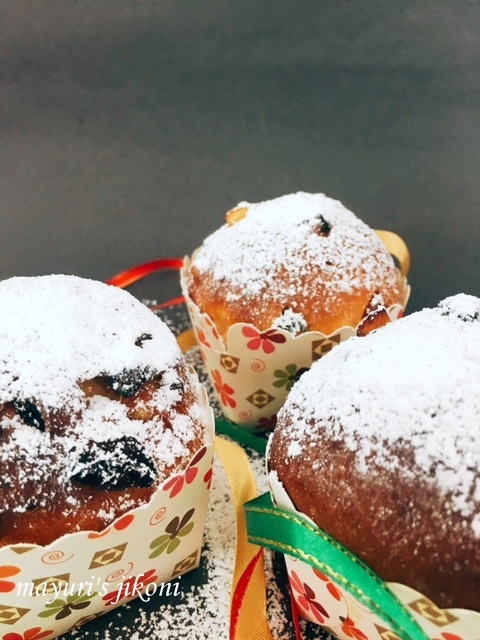 I made these mini panettone again without eggs but found they turned out too dense in spite of adding more milk and butter. I so love your idea of these mini panettones. And yes, I can't and don't want to wait for Christmas to eat these! These should be a norm!! Thank you for participating this month! Your Mini Panettone came out beautifully. I like the mini size so I don't have to share and it doesn't look so bad when I eat half a loaf. I love panettones! These mini versions are adorable! LOVE these little mini panettones. So perfect to have a little loaf all to one's self. And definitely a bread that should be celebrated all year round! I love your minis! I happen to have some little panettone papers, and just might have to try these now! With their size, there's no need to hang them upside down, right? Trust me Julie each one is quite rich but then they say dried fruits are good for health :)Mini ones makes one feel less guilty. Thanks Anne, I think so too, one shouldn't wait till Christmas to enjoy any of the baked goodies. Thank you Karen. Since these were not baked in the tall mini panettone molds, no need to hang them. When I did my research, none of them hung their mini panettone though they used the original mold. This bread is on my to do list.. love this bread. Veena, it did taste really great with all the fruits and range zest. Wow, you mini panettones look absolutely amazing Mayuri. Awesome pick for this month's bread bakers.